The first cafes opened in Istanbul in the late 16th century, and within a few decades, coffee houses appeared throughout the Mediterranean. Coffee-roasting shops began to appear in Europe during the 18th century, as coffee drinking became widespread on the continent. These shops usually sold tea, spices, and coffee, which they purchased as green beans and roasted as needed. They blended beans from different stocks; coffee tastes and preferences in each nation were influenced by the types of coffee beans that traders obtained from their colonial sources. Greg Jaffe. Chicago Tribune. Sunday, 21 Apr 2019 15:30:00 PDT. PR Newswire. Saturday, 20 Apr 2019 09:36:00 +0000. Late in the 18th century, coffee shops became popular in Britain's North American colonies as well, after the British imposed a heavy tax on tea imported by their American subjects. Indeed, the founding fathers of the United States met in coffeehouses to develop strategies for the new nation. How much do people like their coffee? Well, along with water and tea, coffee is one of the three most popular beverages. Northern Europeans drink the most coffee — about 11 kilograms, or 24 pounds, per year. Germans drink about 9 kilograms of coffee per year, while the French drink about 6 kilograms per year. Italians and Americans drink about 4 to 5 kilograms, or 10 pounds, of coffee each year. On average, people drink about one third as much coffee as the amount of water they consume. That's quite a bit! After crude oil and all of its derivatives, coffee is the second most traded commodity in the world today. If you are not impressed yet, consider that seven million tons of coffee are forecasted to be produced annually by the year 2010! Growing altitude: 3000 ft. - 6000 ft. sea level - 3000 ft. There are two types of coffee plant. Coffea Arabica, considered the tastier of the two, is native to Ethiopia and has been grown in Arabia for more than a thousand years. Coffea Robusta is generally grown where Arabica won't thrive. It does not have as much flavor, and is cheaper to buy than Arabica. It is quite bitter, and is often used in espresso to achieve a foamy head. To your right is a table that shows the main attributes of the Arabica and Robusto coffee species. Within the general Arabica and Robusta species, there are many different coffee varieties, each with their own subtle flavor distinctions. Many of these coffees are available in both caffeinated and decaffeinated versions. A major misconception about coffee is that it comes from beans. This is not strictly true! What you think of as beans are actually coffee seeds. Coffee roasters roast these seeds to give every coffee its distinct flavor. Coffee is such a staple at our homes and offices, that many people take advantage of a coffee delivery service. These convenient services can help ensure that you always have the ingredients for a hot cup of java on hand! 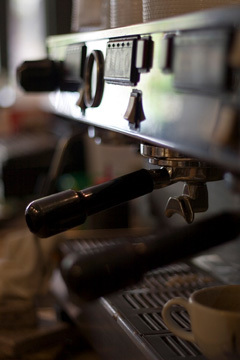 CoffeeShop.us features a directory of online coffee shops and coffee roasters, as well as an overview of coffee varieties. You can also learn about the coffee growing and coffee roasting processes. Please browse through our coffee resources, and shop for a good selection of gourmet coffees and coffee gifts. For larger quantities of coffee beans, please visit our wholesale coffee website. With over 15,000 Starbucks coffee shops in over 50 countries, Starbucks is a well-known specialty coffee roaster. Starbucks roasts and serves whole bean coffees and espresso drinks along with teas, pastries, and other bakery items; their shops provide a comfortable, coffeehouse environment for work or relaxation. Peet's Coffee and Tea roasts coffee with a rich complexity, emphasizing smaller batches, superior beans, and hand roasting. Peet's Coffee and Tea helped spur the specialty coffee movement and attracts connoisseurs who truly love the taste of coffee. 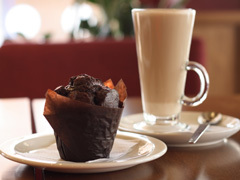 Gloria Jean's is a specialty coffee franchise with over 25 years of experience in gourmet coffee flavors and blends. Often found in shopping malls, Gloria Jean's takes pride in the aroma, body, and taste of their coffee. Ancora Coffee Roasters began in Wisconsin and Ancora Coffee is now served at independent coffeehouses and fine restaurants across the nation. Check out their online selection of premium roasted coffees made from beans grown all over the world. With such a wide variety to choose from, discerning coffee lovers are sure to find the perfect taste for their palates. Dunn Brothers Coffee specializes in coffee fresh roasted in-house from high grade Arabica beans. Dunn Brothers creates and serves a variety of coffee, espresso and tea selections, and seeks to provide local music, art, and free WIFI in their shops. This specialty coffee franchise company is dedicated to serving single-origin coffee that is roasted fresh daily and served in a welcoming and community-oriented coffee shop atmosphere. As many coffee lovers will tell you, Dunkin' Donuts doesn't just serve a good selection of donuts, bagels, and breakfast sandwiches; they also brew a delicious cup of coffee! Whether Original Blend, Decaf, French Vanilla, Hazelnut, or Dunkin' Dark, coffee drinkers can select their favorite blend for breakfast or anytime. 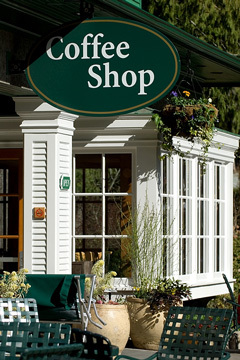 This Michigan-based gourmet coffee store chain features several varieties of brewed coffee and specialty coffee drinks. They micro-roast their beans to lock in flavor and taste. View their in-store menu and order from an on-line selection of signature, decaf, and flavored beans, as well as premium teas from Asia and India. Founded in 1981 as Green Mountain Coffee, Vermont-based Keurig Green Mountain has become one of America's leading specialty coffee companies. In addition to roasting coffee, the firm offers the Keurig coffee brewing system and helps to protect the environment and support local communities. Shop online for a selection of K-Cup coffees, premium whole bean or ground coffees, and gifts and sampler packs. Known as "The Heavenly Coffee", Chock full o' Nuts became a beloved New York coffee brand after the first shop was opened in New York City in 1932. There are now locations in New Jersey, Massachusetts, Illinois, and Florida as well. A variety of coffees, hot and cold specialty drinks, smoothies, sandwiches, and baked goods are served in-store, and Chock full o' Nuts canned and whole bean coffee can be purchased online. Eight o' Clock coffee is made with a smooth, satisfying blend of premium Arabica beans. Available at many groceries and superstores nationwide, and with twelve varieties to choose from, Eight o' Clock coffee offers good value for every coffee drinker. Many of us can recite the Folgers jingle by heart, and its convenience and great taste has made it the number one coffee in America. Folgers offers classic and instant selections, as well as gourmet varieties and K-Cup sizes. Folgers can be found in just about every major grocery and superstore nationwide. Use the online product locator to find a nearby store. Lavazza is Italy's leading retailer of premium espresso, utilizing flavorful and aromatic beans. For discriminating coffee and espresso drinkers, Lavazza's strong, full-bodied dark roast coffee or espresso is hard to beat. Founded in 1892, Maxwell House remains one of America's leading coffee brands. Maxwell House provides ground caffeinated and decaffeinated blends, as well as instant coffee and packets for mornings on the go. Maxwell House coffee can be found at major grocery stores and superstores nationwide. Creating good coffee is an art, and Bellissimo is dedicated to those who are pursuing that art. They provide consulting, barista training, and media resources to help those in the specialty coffee industry succeed. Whether you are looking for training, opening your own coffee shop, or revitalizing an existing existing shop, Bellissimo can help! This intergovernmental coffee organization brings together exporting and importing governments to address challenges facing world coffee markets through international cooperation. This coffee supplier directory lists coffee retailers throughout the United States of America.